Imaging exposure time only 7.4 seconds, thus only 1/4 of the radiation exposure incurred with traditional devices. Imaging exposure time approx. 4.9 seconds, thus only 1/10 of the radiation exposure incurred with traditional devices. Super High Quality Image – The Veraviewepocs has high resolution even in Fine High Speed Mode. The resulting image has high resolution, with superbdensity and contrast. Digital Direct AE (automatic exposure) and Automatic Image Enhancer always obtains the optimal image. DDAE controls the X-ray tube voltage (kV) and current (mA) simultaneously by detecting X-rays passing through the patient. This improves the dynamic range, and, along with Automatic Exposure (AE), results in exceptionally clear images with the best possible contrast and even density. The automatic exposure level can be adjusted to meet your individual requirements. Automatic Image Enhancer enhances the details that can be observed in areas which are either extremely white or extremely black. DDAE and AIE perform a logarithmic conversion to produce the highest quality image possible. Fine High Speed Mode: Pixel size is reduced to 25% compared with the former model, so it produces superior images of a higher resolution. Easy, optimal patient positioning made possible with innovative technology. The Light beam sensor automatically positions the C-arm without the patient having to move. 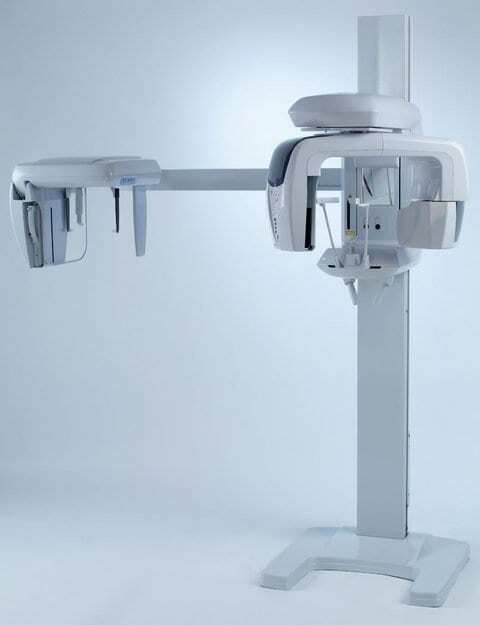 It then measures the distance to the patient's anterior teeth and AF automatically moves the C-arm into the optimum position. This creates images with a high degree of reproducibility. The electric motor of Veraviewepocs 2D enables convenient lift movement for smooth slow-starts and slow-stops. It is equipped with an automatic overload stop function for safety. In addition, the C-arm is lined up to the patient for easier patient positioning. Since the arm moves back and forth to line up with the patient, the patient does not have to move and can maintain a comfortable posture. The patient‘s position is checked with the triple laser beams: the frankfurt plane beam, the sagittal plane beam, and the image layer beam for accurate positioning. The carbon temple stabilizing rods absorb almost no X-radiation and reduce the shadow of the rods in the image. The chin rest can be set at three different heights. The Veraviewepocs 2D offers a width of up to 480 mm to accommodate patients in wheelchairs. For patients with a wheel chair span greater than 480 mm, there is an optional wallmounted version available. Multi-projections fit a variety of purposes. Consistent magnification is maintained throughout the image. Distance from the X-ray tube to the patient is consistent, providing uniform magnification. In this way the overlapping of neighboring teeth or the shadow on the mandibular ramus is reduced, providing optimal results for jaw exposures. The thick / specially-designed image layer accommodates all the possible variations of dental arch shapes and sizes to produce extremely clear and sharp images. The X-ray image is enlarged by a factor of 1.6 – the best prerequisite for an even better diagnosis. For children or people with small jaws. The arm‘s rotation range is reduced, and thus lessens the X-radiation. Sharp, clear images of the TMJ are produced by aligning the angle of X-ray penetration with the longitudinal axis of the mandibular condyle head. The perpendicular projection of the X-ray reduces the amount of overlapping with emphasis on the maxillar bicuspid region. Produces images with less mandibular ramus shadow. 7. 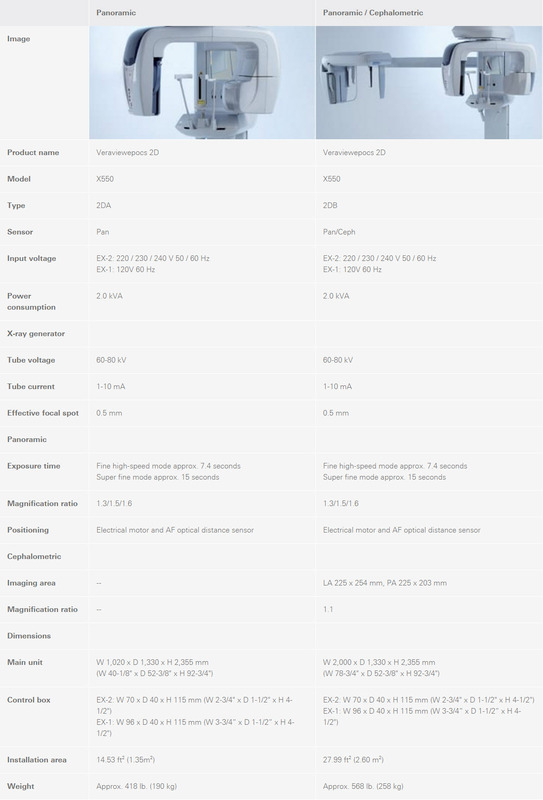 Please compare: Orthoradial Panoramic, shadow reduction panoramic, and standard panoramic are taken for the same patient. Here would be changed the X-ray projection angle – and not the image layer orbit. In this way the overlapping of neighboring teeth or the shadow on the mandibular ramus is reduced. These images are good for diagnosis of dento-maxillo facial areas. Clear Images of the Maxillary Sinus Region. The Veraviewepocs System offers high speed performance requiring only 4.9 seconds for a cephalometric scan. The speed helps ensure high quality images each and every time. For pediatric patients, the reduced scan time is especially helpful as repeat images due to patient movement is virtually eliminated. A brand-new development: our special high-resolution CCD sensor with a height of 225 mm now makes digital cephalometric possible! Simply insert the new digital cassette and remove it again. One digital cassette can be used for both digital panoramic and digital cephalometric imaging. The variable image processing technique generated optimum grayscale values – by offering different cassette running speeds for hard and soft tissue.